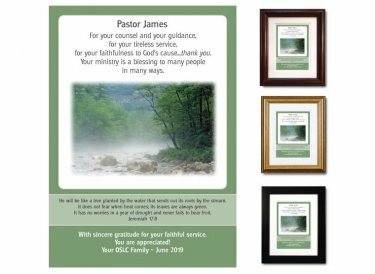 Lovely pastor appreciation plaque features this sentiment: For your counsel and guidance, for your tireless service, for your faithfulness to God's cause...thank you. Your ministry is a blessing to many people in many ways. Beneath it, a rendering of a tree by a stream aptly illustrates the featured Scripture verse: He will be like a tree planted by the water that sends out its roots by the stream. It does not fear when heat comes; its leaves are always green. It has no worries in a year of drought and never fails to bear fruit. You''ll personalize it with clergy's name (which will appear at the top) and your special message (on the example, the white text at the bottom).